Q. What are the most common symptoms of RLS? A. People who experience RLS describe the feelings in the legs as creeping, crawling, itching, tingling, pulling, aching, and even as feeling like electric shocks. Q. Does RLS affect the legs alone? A. No. Symptoms can occur on the arms and the torso, though they are usually felt in the legs. Q. What is the impact of the sleep deprivation caused by RLS? A. Clinical studies indicate that sleep deprivation causes an overall weakening of the immune system, risk of a variety of chronic illnesses, and even psychological effects including memory loss, mood swings and depression. Sleep deprivation can also shorten your life expectancy. Q. Are there substances that people with RLS should avoid? A. Yes. Health care providers recommend that you reduce or eliminate your intake of alcohol and caffeine as they can aggravate your symptoms. Antihistamines such as Benadryl can also have a harmful effect. Certain antidepressant and psychiatric medications should also be avoided. Please discuss your condition with your physician before he or she prescribes medication. Q. Does RLS only affect adults? A. No. Although RLS is most often diagnosed in middle age, it can affect people of all ages. Q. Does RLS run in families? A. RLS has been linked to familial origin in about 50% of all cases. A. Precise causes are not known. However, researchers have discovered that RLS tends to run in families, sometimes appears to be the result of another condition which can worsen the RLS symptoms, and that anemia and low-levels of iron can also worsen RLS symptoms. Q. Is RLS psychosomatic (all in my head)? A. Definitely not. RLS has been a recognized medical condition for more than 200 years. Q. Can strenuous exercise minimize symptoms? A. To the contrary, strenuous exercise tends to worsen the symptoms of RLS; however, moderate exercise taken well before bedtime can be helpful. Q. Can Restless Legs Syndrome develop into a more serious illness? 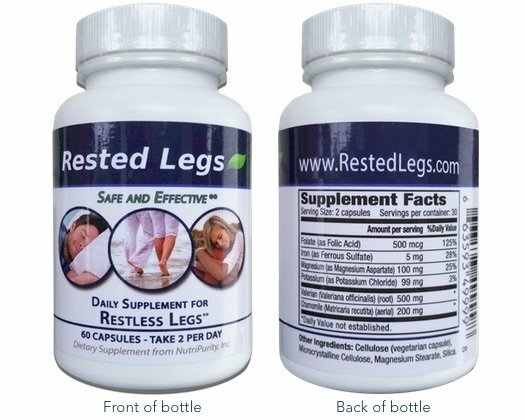 Rested Legs is available for $19.95 plus $3.00 shipping for one bottle. If you order three bottles, the price is $49.95 and you get FREE shipping. That comes out to $16.65 per bottle. It’s a great value. You’re going to love your Rested Legs! If you do not love Rested Legs for any reason, simply return your order for a complete refund. The statements made on this website have not been evaluated by the Food & Drug Administration. The FDA evaluates only food and drugs, not supplements like this product. Copyright © 2012 - 2018 NutriPurity, Inc.